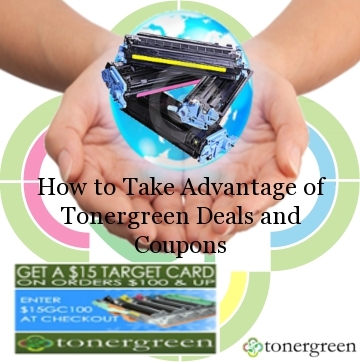 How to Take Advantage of TonerGreen Deals and Coupons | TonerGreen - Eco-Friendly Toners from the U.S.
TonerGreen, the leading provider of eco-friendly U.S. made remanufactured toner cartridges and remanufactured inkjet cartridges, has aim to be the leader in providing environmentally responsible printing solutions to help save the Earth since its inception on the year 2009. But our goal doesn't simply end there, apart from helping our customers make eco-friendly choices for their home and office, TonerGreen also wants to provide customers with affordable remanufactured printer cartridges to help them save money. In addition to that, at TonerGreen.com, we make your online shopping more unforgettable by giving you online coupons that allow you and other customers to attain discounts and percent off savings by keying in the coupon code on the designated box at the check out page. TonerGreen also offer promos that doesn't require you to have any coupons to have a discount, like our free-shipping promo for customers who would purchase TonerGreen printer consumables amounting to $50 dollars and above. There's also a 10% off on all orders amounting to $300 and above. Think of the green bucks you can save with these TonerGreen promos.You can also get the latest TonerGreen promos and coupons by signing up on our mailing list. We'll send you up-to-date offers and coupons straight to your inbox. You can select your brand from our wide selection of remanufactured laser toner cartridges for renowned printer brands like HP, Brother, Canon, Dell, and other printer brands. Our remanufactured toner cartridges went under meticulous quality-control process to ensure you that they live up to the standards and performance of their OEM counterparts. All our remanufactured toner cartridges are also backed by 100% satisfaction guarantee to work in your printer and provide consistent, high-quality output. TonerGreen.com, is the best choice if you want to help save the environment and save some cash. There's no easy way to go Green than to start with TonerGreen.com!